Welcome to Down On The Street, where we admire old vehicles found parked on the streets of the Island That Rust Forgot: Alameda, California. 1970s Benzes are quite common on the island, but not W114 coupes! The thing about the W114 and this series is that the old indestructible Mercedes-Benzes have been part of the scenery for so long that they don't really catch my eye on the street. 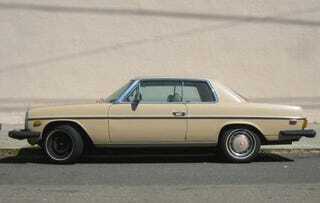 When I see a not-so-old SL, I'll usually shoot it, but a W114 sedan? Maybe next time- it'll still be around in 20 years, so no rush. A coupe, however- that's a different story! I thought the beige car against a beige background looked pretty cool, too. Even with the Malaise Era 5 MPH crash bumpers, this 35-year-old machine is a real beauty. And with the big 2.8 liter M110 engine it's probably pretty quick as well.